Several weeks ago I obtained a few samples from EndlessSunSolar.com’s product line of portable solar solutions. First up for testing is their NOMAD 5 Thin Film 5W Solar Charger. One of the first things I noticed when I received the NOMAD was how large it was – and how small. Yeah, I know – How can that be? Well, due to the thin-film construction the NOMAD is extremely flexible – thus although it is large for a 5 watt panel – it will roll up to be very small, and compact. It can be rolled right up and stashed in a Go Bag or car trunk. Unlike many portable solar solutions today which charge a battery pack and then the battery pack charges your device – the NOMAD 5 is a direct power provider. This means that you charge your device directly via the included USB power port. So – as long as your device (or batteries) can be plugged into a USB port – you should be good to go (several adapters are included as well). To try out the NOMAD 5 – I tried charging three devices. Here is how it went. Samsung Galaxy S3 Smart Phone – No problem. The NOMAD 5 charged my S3 from 32% to over 65% within a couple hours in decent sun. GoalZero Battery Pack – No problem. Charged this pack of four AA rechargeable batteries. How long? Not sure. I left it outside while I was working on some things and forgot about it. After several hours I remembered and found it fully charged. Blackberry Phone – This is my work phone and I hate it but the NOMAD charged it just fine. The NOMAD performed these simple tasks with no issues. I also saw that even in overcast skies – my Galaxy S3 continued to received charging power. The NOMAD 5 seems to be very ruggedly built. Grommets await at each corner to facilitate hanging and positioning to soak in the sun’s energy. I see many possibilities for erecting the NOMAD 5 up in a camp site, on top of a vehicle, or in a back yard after a power outage. Now – this is not power to run devices – but rather to charge them. 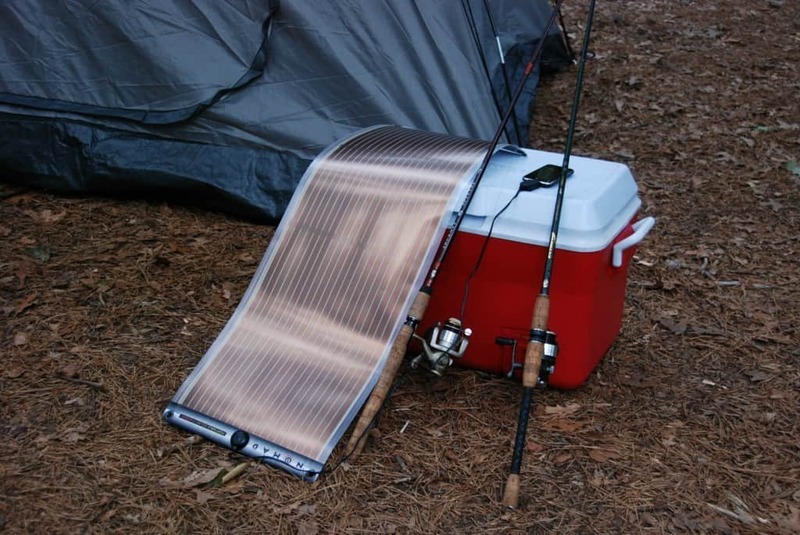 From what I have seen – the NOMAD 5 Thin Film 5W Solar Charger does an excellent job. Cost? At publishing time this Made in the USA product is priced at $79.99. This looks like a very interesting solar charger and the 55 watt one available from same source also looks like a good solution. But, what do you get if you’re looking for something to handle a freezer or fridge ? You can obviously tell I am new to this subject ! A freezer or fridge will consume substantial energy. A much larger solar array would be needed to charge a large battery bank in order to run your stuff. Solar can be a complicated and very expensive subject. One thing to remember – solar is for charging batteries and the batteries are for running things. Nano Solar has had this ink printed solar film panel out around eight years now and there has been sufficient time to analyze the pros and cons. You should go their website and research the history behind this process for direct thermalvoltaic conversion. Well Rourke & Mike ! the way it was put above that solar is for charging batteries & the Batteries are for running the devices, Is only if you are going for an OFF GRID SYSTEM. If you want to have it running the house incase of a Power Outage you’ll need A Bi-Modal System this is a Utility Interactive Sytem With A (Criticals) Battery Backup, The Criticals are things like Medical Equipment, Frigs., Freezers, or Lights & a TV, Etc. whatever you want Powered incase of an Outage, & can be setup to provide whatever power is needed or Required for 3-7 Days. Normally But if you have the ca$h to burn you can get it for any lenght of time ! Running your entire house off grid with solar would cost tens of thousands of dollars – at least for a regular house with air conditioning, appliances, heat, etc. For the vast majority is -of people – and I think running a fridge is included in this – solar MUST charge batteries as at night the fridge would still need power. That is why batteries are required. Oh Yeah ! & Solar only works in the Daytime PEOPLE thus it’s called SOLAR ! Solar charges batteries in the daytime – but the batteries can work all night. These are nice little stand alones. I like the thin film tech as it is transportable. 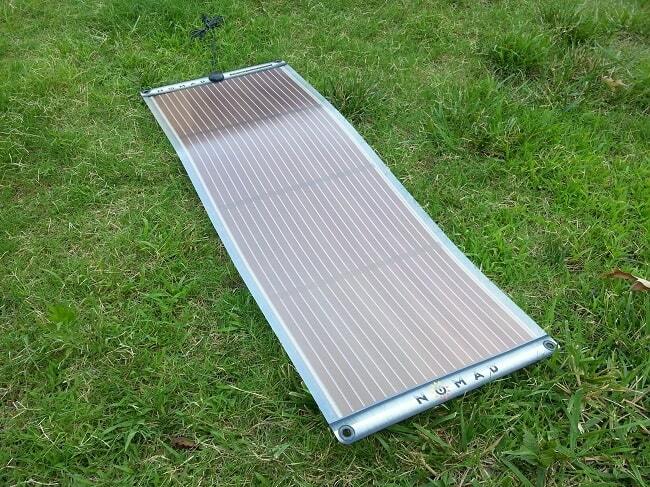 I have four 119 watt roll up panels that put out just less than 500 watts at 24 volts, cost about $375 total. Granted still need battery bank,charge controller and inverter, which I have in triplicate. The quality battery bank is what will empty your wallet, unless of course you are under the mistaken assumtion that you can just lash a bunch of old car batteries together.They will work for awhile, but eventually the different ages and efficeincy will cause problems. Regards, D.
Actually John, you could probably run a panel only fridge with a carefully monitored fridge turned up to its coldest in the daytime and switched off at night. (stay out of it at night and keep the door shut!) It would most likely keep well until sun-up and useful panels again. Of course a few days of storms would blow that plan out of the water. But in a pinch…….. Regards, D.